Bank of Cyprus is the country’s largest bank. 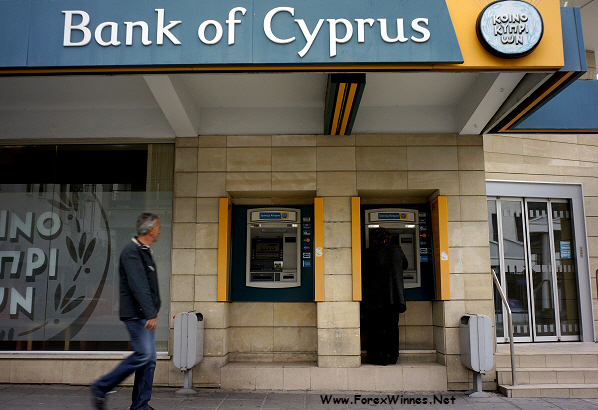 Banks in Cyprus are to reopen on Thursday at 10:00 GMT, 10 days after they closed to prevent a bank run as a controversial bailout was negotiated. Banks will open their doors between noon and 18:00 local time, the Cypriot central bank said. Customers will also be limited to withdrawing 300 euros ($383; £253) a day, to prevent everyone fleeing with their savings. Earlier, the boss of the Bank of Cyprus was sacked. “I am telling you that all banks are definitely going to open tomorrow,” the Cypriot central bank’s Aliki Stylianou said, which comes after several false announcements of when bank customers will be able to access their funds. Capital controls are to be imposed as Cyprus seeks to raise 5.8bn euros to qualify for a 10bn-euro bailout from the European Union, European Central Bank and the International Monetary Fund, the so-called troika. Cyprus Finance Minister Michalis Sarris announced a long-awaited series of capital controls, including the 300-euro daily withdrawal, and no cheques can be cashed. He cited the “lack of substantial liquidity and significant risk of deposits outflow, with possible outcome the collapse of the credit institutions” as the reasons for the restrictions. Bank of Cyprus chief executive Yiannis Kypri confirmed he had been removed as head of the bank, which is the country’s largest commercial lender. Reuters reported that Mr Kypri had issued a statement about his removal, which said: “The reason I was given was that, based on the resolution decree recently passed by parliament, and upon demands of the troika, an administrator had been appointed at the Bank.